Wassily Kandinsky (Russian: Василий Кандинский, first name pronounced as [vassi:li]) (December 4, 1866 Julian calendar, (December 16, 1866 Gregorian calendar) – December 13, 1944) was a Russian painter and art theorist. One of the most important twenieth-century artists, he is credited with painting the first modern abstract works. Although Wassily showed talent as both a musician and artist in his youth, art was a hobby to him until age 30 when he first viewed Monet's "Haystack." It was after this that he started painting studies (life-drawing, sketching and anatomy). Kandinsky's creation of purely abstract style did not come about abruptly, but rather as the fruit of a long period of development and maturation of his own intense theoretical introspection based on his personal experience of painting. He called this devotion to inner beauty, fervor of the spirit and deep spiritual desire inner necessity, which was a central aspect of his art. Not only was Kandinsky a very innovative artist in his day, he was a founder of a number of art education facilities and an apt administrator. Even more importantly, he was a visionary who understood the spiritual aspect of life and created works of art to communicate about the spiritual aspect of reality, driven by "inner necessity." Kandinsky was born in Moscow to a wealthy Siberian tea merchant and his wife. Both of Wassily's parents were very musical. He also learned to play the piano at a very young age. His parents were divorced when he was five. At that time, he moved with his father to the home of his aunt in Odessa, Ukraine, where he spent his childhood. Wassily was only 13 when he created his first oil painting. Kandinsky's youth and life brought inspiration from a variety of sources. As a child, he was fascinated and unusually stimulated by color. This is probably due to his synaesthesia which allowed him to hear as well as see color. This fascination with color continued as he grew up, although he made no attempt to study art seriously in his youth. He enrolled at the University of Moscow, studying law and economics. Although quite successful in his profession — he was offered a professorship at the University of Dorpat. In 1889 he was part of an ethnographic group that traveled to the Vologda region north of Moscow. In Looks on the Past he recounts his impressions as he entered into the houses and churches decorated with the most shimmering colors. His study of the folk art in the region, in particular the use of bright colors on a dark background, was reflected in his early work. Kandinsky wrote a few years later that, "Color is the keyboard, the eyes are the harmonies, the soul is the piano with many strings. The artist is the hand that plays, touching one key or another, to cause vibrations in the soul." Kandinsky saw an exhibit of Monet in 1896 and was particularly taken with Monet's depiction of a haystack. For Kandinsky, the painting had a powerful sense of color almost independent of the object itself. He was similarly influenced during this period by Richard Wagner's "Lohengrin," which seemed to Kandinsky to push the limits of music and melody beyond standard lyricism. It was then, at the age of 30, that Kandinsky gave up a promising career teaching law and economics to enroll at the Academy of Fine Arts, Munich. 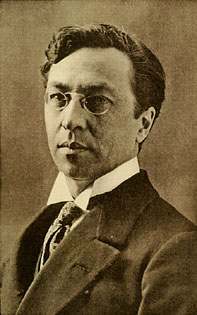 Kandinsky was also spiritually influenced by H. P. Blavatsky (1831-1891), the most important exponent of Theosophy in modern times. Theosophical theory postulates that creation is a geometrical progression, beginning with a point. The creative aspect of forms is expressed by descending series of circles, triangles, and squares. Kandinsky's books, Concerning the Spiritual In Art (1910) and Point and Line to Plane (1926) echoed this basic Theosophical tenet. Kandinsky's time at art school was enhanced by the fact that he was older and more settled than the other students. He quickly began to emerge as an art theorist as well as a painter. Unfortunately very little exists of his work from this period. Much more of his work remains from the early twentieth century, including many paintings of landscapes and towns, with broad swathes of color but recognizable forms. For the most part, Kandinsky's paintings did not emphasize any human figures. An exception is Sunday, Old Russia (1904) where Kandinsky recreated a highly colorful (and no doubt fanciful) view of peasants and nobles before the walls of a town. Riding Couple (1907) depicts a man on horseback, holding a woman with tenderness and care as they ride past a Russian town with luminous walls across a river. The depiction of the horse is muted, while the leaves in the trees, the town, and the reflections in the river glisten with spots of color and brightness. The work shows the influence of pointillism, a style of painting in which non-primary colors are generated by the visual mixing of points of primary colors placed very close to each other. It blends back-, middle-, and foreground into a luminescent surface. Fauvism is also apparent in these early works. Fauvism is a short-lived and loose grouping of early Modern artists whose works emphasized painterly qualities, and the use of deep color above the representational values retained by Impressionism. Fauvists simplified lines, made the subject of the painting easy to read, exaggerated perspectives and used brilliant but arbitrary colors. They also emphasized freshness and spontaneity over finish. Perhaps the most important of Kandinsky's paintings from the decade of the 1900s was The Blue Rider (1903) which shows a small cloaked figure on a speeding horse rushing through a rocky meadow. The rider's cloak is a medium blue. The shadow cast is a darker blue. In the foreground are more amorphous blue shadows, presumably the counterparts of the fall trees in the background. The Blue Rider in the painting is prominent, but not clearly defined, and the horse has an unnatural gait (which Kandinsky must have known). Some believe that a second figure, perhaps a child, is being held by the rider though this could just as easily be another shadow from a solitary rider. This type of intentional disjunction allowing viewers to participate in the creation of the artwork became an increasingly conscious technique of the artist in subsequent years — culminating in his great "abstract expressionist" works from 1911-1914. In The Blue Rider Kandinsky showed the rider as a series of colors. The Blue Rider is not exceptional when compared to the works of other contemporary painters, but it does foreshadow the direction that Kandinsky would take only a few years later. 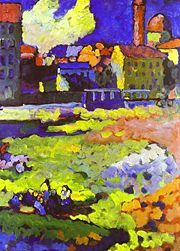 Kandinsky spent a great deal of time during 1904 to 1906 traveling across Europe with his mistress, Gabriele Munter for exhibitions. They settled in Paris in 1906. The following year, feeling increasingly alienated from Gabriele and suffering severe frustration about his work, he settled alone in the small Bavarian town of Murnau am Staffelsee. The focus of his painting while he was in Bavaria was landscapes. The Blue Mountain, (1908 – 1909) painted during this time showed his trend towards pure abstraction. A mountain of blue is flanked by two broad trees, one yellow, and one red. A procession with three riders and several others crosses at the bottom. The face, clothing, and saddles of the riders are each of a single color, and neither they nor the walking figures display any real detail. The broad use of color in The Blue Mountain, illustrate Kandinsky's move towards art in which color is presented independently of form. Moving again in 1908, this time to Munich with Munter, Kandinsky began a period of intense creativity. He mastered the Bavarian peasant technique of painting on glass, and wrote poetry and plays. This was also when he befriended and became close to artist Paul Klee and composer Arnold Schoenberg. Kandinsky helped found and establish the New Artists' Association of Munich (Neue Künstlervereinigung München), becoming its president in 1909. The group was unable to integrate the more radical approach of those like Kandinsky with more conventional ideas of art and it dissolved in late 1911. The paintings of this period are composed of large and very expressive color masses evaluated independently from forms and lines which no longer serve to define the masses, but are superimposed and overlap in a very free way to form paintings of extraordinary force. The influence of music played an important role in the birth of abstract art. Music is not representational, but more immediately expresses emotion. Kandinsky sometimes used musical terms to designate his works: he called many of his most spontaneous paintings "improvisations," while referring to more elaborate works as "compositions." In addition to painting, Kandinsky developed his voice as an art theorist. Kandinsky probably had more influence on Western art because of his theoretical works. When the New Artists Association folded in late 1911, Kandinsky moved to form a new group, The Blue Rider (Der Blaue Reiter), with like-minded artists such as Franz Marc. The group released an almanac, also called The Blue Rider and held two exhibits. More were planned, but the outbreak of World War I in 1914 ended these plans and sent Kandinsky home to Russia via Switzerland and Sweden. The Blue Rider Almanac and Kandinsky's treatise On the Spiritual In Art, released at almost the same time, served as a defense and promotion of abstract art, as well as an argument that all forms of art were equally capable of reaching a level of spirituality. He believed that color could be used as something autonomous and apart from a visual representation of an object or other form. During the years 1914 to 1921, Kandinsky painted very little. This was a period of great social and political upheaval in Russia and Europe. Kandinsky played a role in the cultural and political developments in Russia, contributing to the domains of art pedagogy and museum reforms. He devoted his time to teaching art with a program that was based on form and color analysis. Kandinsky also immersed himself in the founding and administration of the government-run art education programs, the Artistic Culture Institute and the Museum of Pictorial Culture in Moscow. In 1916 he met Nina Andreievskaia, whom he married the following year. Five years later, Kandinsky was invited to go to Germany to attend the Bauhaus of Weimar, by its founder, the architect Walter Gropius. Since Kandinsky's theories about art conflicted with the official Russian Marxist-Leninist theories, he decided to accept Gropius' invitation and return to Germany in 1921. The following year, the Soviets officially banned all forms of abstract art, judging it harmful to the socialist ideal. The Bauhaus was an innovative architecture and art school. Kandinsky taught there from 1922 until it was closed by the Nazis. Objectives of the school included the merging of plastic arts with applied arts. Teaching methods reflected the theoretical and practical application of this synthesis. Kandinsky taught the basic design class for beginners, the course on advanced theory as well as painting classes and a workshop where he completed his colors theory with new elements of form psychology. Geometrical elements took on increasing importance in his teaching as well as his painting, particularly the circle, half-circle, angle, straight lines and curves. This period was a period of intense production for Kandinsky. His new sense of freedom was characterized in his works by the treatment of planes, rich in colors and magnificent gradations. The development of his works on form, particularly on point and different forms of lines, led to the publication of his second major theoretical book Point and Line to Plane in 1926. In the painting Yellow – red – blue (1925), Kandinsky demonstrated his distance from constructivism and suprematism, artistic movements whose influence was increasing at the time. The large, two-meter-wide painting consists of a number of main forms: a vertical yellow rectangle, a slightly inclined red cross and a large dark blue circle, while a multitude of straight black or sinuous lines, arcs of circles, monochromatic circles and a scattering of colored checkerboards contribute to its delicate complexity. Appreciation of the painting requires deep observation, not only of its forms and colors, but also their relationship to one another, as well as their whole and reciprocal harmony. Due to the hostility of the political climate, the Bauhaus left Weimar and settled in Dessau in 1925. Kandinsky's work In 1929, the year of a great crisis at the Bauhaus, he created his picture Innerer Bund (Inner Bound) was created at this time. Following a fierce slander campaign by the Nazis when the Bauhaus was headed by Hanns Meyer, a self-proclaimed Marxist, the Bauhaus was forced to close in 1932. The school pursued its activities in Berlin until its dissolution in July 1933. Kandinsky then left Germany and settled in Paris. Kandinsky lived the rest of his life in Paris, becoming a French citizen in 1939. Abstract painting, particularly geometric abstract painting, was not recognized in Paris so he was quite isolated. The artistic fashions were mainly impressionism and cubism. He lived in a small apartment and created his work in a studio constructed in his living room. He used biomorphic forms with non-geometric outlines in his paintings. The forms were suggestive of microscopic organisms but expressed the artist's inner life. He used original color compositions that evoked Slavic popular art and looked like precious watermark works. He also used sand mixed with color to give a granular texture to his paintings. Kandinsky's works of this period were a vast synthesis of his previous work. In 1936 and 1939 he painted his two last major compositions. Composition IX is a painting with highly contrasted powerful diagonals whose central form gives the impression of a human embryo in the womb. The small squares of colors and the colored bands stand out against the black background of Composition X, like fragments of stars or filaments, while enigmatic hieroglyphs with pastel tones cover the large maroon mass, which seems to float in the upper left corner of the canvas. In Kandinsky’s works, some characteristics are obvious. Some touches are more discrete and veiled, revealing themselves only progressively. His influence on other artists of the middle and late twentieth century, like the Belgian etcher Rene Carcan, was significant. He died at Neuilly-sur-Seine in 1944. Kandinsky wrote that "music is the ultimate teacher" before embarking on the first seven of his ten Compositions. The first three survive only in black-and-white photographs taken by fellow artist and mate, Gabrielle Munter. While studies, sketches, and improvisations exist (particularly of Composition II), a Nazi raid on the Bauhaus in the 1930s resulted in the confiscation of Kandinsky's first three Compositions. They were displayed in the State-sponsored exhibit "Degenerate Art" then destroyed along with works by Paul Klee, Piet Mondrian, Franz Marc, Vincent van Gogh, Paul Cezanne, Ludwig Kirchner and other contemporary modern artists. 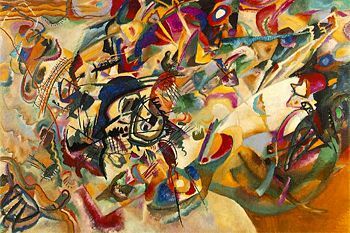 Influenced by Theosophy and the perception of a coming New Age, a common theme for Kandinsky in the first seven Compositions was the Apocalypse, or the end of the world as we know it. Kandinsky was raised an Orthodox Christian. He drew upon the Biblical mythology of Noah's Ark, Jonah and the Whale, Christ's Anastasis and Resurrection, the three Marys' discovery of the Empty Tomb, the Riders of the Apocalypse in the book of Revelation, various Russian folk tales, and the common mythological experiences of death and rebirth. He used these themes showing a coming cataclysm which would alter individual and social reality to create paintings in the years immediately preceding World War I. He never attempted to picture any one of these stories as a narrative, but used their veiled imagery as symbols of the archetypes of death / rebirth and destruction / creation he felt were imminent during the run up to World War I.
Kandinsky felt that an authentic artist creating art from "an internal necessity" inhabits the tip of an upward moving triangle. This progressing triangle is penetrating and proceeding into tomorrow. Accordingly, what was odd or inconceivable yesterday becomes commonplace today. What is avant garde (and only understood by the few) today is standard tomorrow. The modern artist/prophet stands alone at the tip of this triangle making new discoveries and ushering in tomorrow's reality. Kandinsky became aware of Einsteinian physics, Freudian psychology, airplane flight, x-rays, as well as the advances of modern artists like Pablo Picasso and Henri Matisse. All contributed to radically new ways of seeing and experiencing the world. Composition IV and subsequent paintings are primarily concerned with evoking a spiritual resonance in viewer and artist. In his painting of the apocalypse by water (Composition VI) and others, Kandinsky portrays epic myths by translating them into contemporary terms along with a sense of desperation, flurry, urgency, and confusion. the artist's original impulse is evoked in the viewer by the artwork. Kandinsky never completely abandoned reference to the visible world the way New York Abstractionists Jackson Pollock and Mark Rothko did in the 1950s. In fact, he claimed there was nothing abstract about his paintings at all and preferred the term "concrete art" to describe them, feeling they confront the viewer as solid, unique objects in and of themselves. He sought to produce a strictly spiritual communication between viewer and painter. His works make oblique reference to the visible world rather than representing it. As Der Blaue Reiter Almanac essays and his theorizing with composer Arnold Schoenberg indicate, Kandinsky expressed the communion between artist and viewer as being simultaneously available to the senses and the intellect, as in (synaesthesia). Hearing tones and chords as he painted, Kandinsky theorized that, for example, yellow is the color of middle-C on a piano, a brassy trumpet blast; black is the color of closure and the ends of things; and combinations and associations of colors produce vibrational frequencies akin to chords played on a piano. Kandinsky also developed an intricate theory of geometric figures and their relationships, claiming that the circle is the most peaceful shape and represents the human soul. These theories are set forth in "Point and Line to Plane." Because of his influence as a theorist, Kandinsky is often considered a peer to Picasso in the area of form, and Matisse in color. During months of studies Kandinsky made in preparation for Composition IV he became exhausted while working on a painting and went for a walk. While he was out, Gabrielle Munter tidied his studio and inadvertently turned his canvas on its side. Upon returning and seeing the canvas—not yet recognizing it—Kandinsky fell to his knees and wept, saying it was the most beautiful painting he had seen. He had been liberated from attachment to the object. As when he first viewed Monet's Haystacks, the experience changed his life and the history of Western art. In another event with Munter during the Bavarian Abstract Expressionist years, Kandinsky was working on his Composition VI. From nearly six months of study and preparation, he had intended the work to evoke a flood, baptism, destruction, and rebirth simultaneously. After outlining the work on a mural-sized wood panel, he became blocked and could not go on. Munter told him that he was trapped in his intellect and not reaching the true subject of the picture. She suggested he simply repeat the word "uberflut" ("deluge" or "flood") and focus on its sound rather than its meaning. Repeating this word like a mantra, Kandinsky painted and completed the monumental work in only a three-day span. Kandinsky compares the spiritual life of humanity to a large Triangle similar to a pyramid. The artist has the task and mission of leading others to the top by the exercise of his talent. The point (apex) of the triangle is constituted only by individuals who bring the "sublime bread" to men. It is a spiritual Triangle which moves forward and rises slowly, sometimes immobile. During decadent periods, souls fall to the bottom of the Triangle and men only search for external success and ignore purely spiritual forces. Kandinsky defines the inner necessity as the principle of efficient contact between form and the human soul. Every form is the delimitation of a surface by another surface. Form possesses an inner content, which is the effect it produces on the attentive viewer. Inner necessity includes a right of the artist to an unlimited freedom. But this freedom becomes a crime if it is not founded on necessity. The art work is born from the inner necessity of the artist to manifest it, in a mysterious, enigmatic and mystic way. Then it acquires an autonomous life. It becomes an independent subject animated by a spiritual breath. Kandinsky, Wassily, Sadler, M. T. (Translator). Concerning the Spiritual in Art. NY: Dover Publ, 1977. ISBN 0486234118. Grohmann, Wil. Wassily Kandinsky. Life and Work. NY: Harry N Abrams Inc. 1958. Hajo Duechting and O'Neill. The Avant-Garde in Russia. Messer, Thomas M. Vasily Kandinsky. NY: Harry N, Abrams Inc. 1997. (Illustrated). ISBN 0810912287. Brief biography of Wassily Kandinsky.www.handprint.com. All links retrieved May 29, 2014. Mark Harden Kandinsky Compositions A review of the book, Kandinsky: Compositions. by Magdalena Dabrowski. Wassily Kandinsky at Olga's GalleryIntriguing biography with mention of his three wives. Wassily Kandinsky: A Virtual Art Gallery Famous artists Gallery. This page was last modified on 29 May 2014, at 15:26.